The regional winner of the 2018 Czech Republic Challenge (along with the first and second runners-up) will receive access to an individually tailored support programme. This will include consulting services in the respective idea’s area of application, as well as assistance in entrepreneurship, technology, IPR, and grants, as well as mentoring from the ESA Business Incubation Centre (BIC) team and free workshop passes for ESA BIC startups. Six months of office/laboratory space at the Science and Technology Park VZLÚ in Prague free of charge, with the option to stay for an additional 12 months at a 30% discount. Services provided by CzechInvest: business coaching, support for the preparation of a proposal for an incubator, technical coaching and assistance, co-working space and travel costs to Awards Ceremony in total value up to EUR 4,000. The Czech Republic is home to many companies, institutions, and research institutes that deal with astronautics and space technologies. Space exploration and research have a long tradition in the country: Intercosmos 1, launched on 14 October 1969, was the first satellite that carried instruments developed in the former Czechoslovakia. Dozens of Czech instruments and systems have been deployed over the past 20 years of space activities, including both terrestrial environment explorations and planetary missions. In 2008, the Czech Republic became the 18th member of the European Space Agency. It continues to be a place of excellence for aeronautics, space technology, satellite navigation, Earth observation, and geographic information systems.The seat of the European GNSS Agency was officially moved to Prague in September 2012. The Czech Ministry of Transport is a state administration central body acting in the matters of transport. It is accountable for the creation of national transport policy and also for its implementation within the scope of its competence. The Ministry of Transport has a governmental competency concerning the participation of the Czech Republic in the European satellite navigation programme Galileo and it plays the role of the national coordinator in the field of satellite navigation development. It is also responsible for coordination of space activities in The Czech Republic in general; it is responsible for Czech membership in European Space Agency (ESA), EU space policy and partnership with the European GNSS Agency (GSA). With Galileo satellite navigation system online, you will always be on the right track! Aerospace Research and Test Establishment (VZLÚ) is a national centre for research, development and testing in aeronautics and space.The main mission of VZLÚ is to generate new knowledge, transfer it into industrial practice and to provide its partners with the maximum support in the development of new products. As a multi-discipline research organisation, VZLÚ exploits synergic effects and also contributes to progress of automotive, rail, defence, security and power industry and civil engineering. VZLÚ owns and operates the Science and Technology Park VZLÚ Prague, which plays an active role in the development of knowledge economy and industry with a main focus on Aerospace, Defence and Security. The park provides a wide range of services which are needed for foundation and operation of innovative companies (laboratory, manufacture, storage and administrative premises, consultancy in R&D, IPR, economics, scientific and technical workshops, transfer of knowledge and technology). CzechInvest is a state contributory organisation subordinated to the Ministry of Industry and Trade of the Czech Republic. Its main objective is to raise the competitiveness of the Czech economy by supporting small and medium-sized enterprises, the domestic business infrastructure and innovation. It attracts to the Czech Republic foreign investors operating in the manufacturing industry, business support services and technology centres, and supports Czech enterprises in their expansion efforts. The agency presents the Czech Republic to other countries as an attractive location for investors and it is the exclusive organisation authorised to submit applications for investment incentives. It also supports Czech companies interested in joining the supply chains of multinational companies. With its services and development programmes, CzechInvest supports the promotion of domestic companies and Czech and foreign investors, as well as the development of the business environment in general. All services are provided free of charge. More information about CzechInvest at www.czechinvest.org. Get your business ideas off the ground in the heart of Europe’s navigation! The ESA BIC Prague opened in 2016 and is managed by CzechInvest (Business and Investment Development Agency CzechInvest), with support from the Ministry of Industry and Trade, the Ministry of Transportation and the City of Prague. 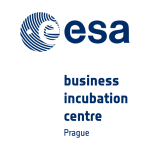 Located in the Prague Startup Centre in the historical Palác Adria palace, right in the centre of Prague, ESA BIC Prague offers a strong support structure with different partners and business alliances.